Home to locally sourced cuisine and stylish hospitality. 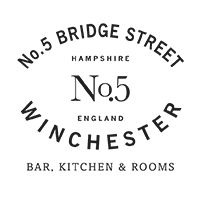 No.5 Bridge Street in Winchester is open for breakfast, lunch and dinner and everything in between. Boasting a vibrant bar and extensive drinks list, guests can relax and unwind with signature cocktails, including No.5’s famous Espresso Martini. To try these cocktails and here’s the important bit – you’ll need to show the team at No.5 your Winchester Cocktail Week wristband and say the words ‘Tell us your secret’.